TOMONOLO 1.4W Solar Bird Bath Fountain Pump | Fountain City Art Ctr. TOMONOLO Upgrade Solar fountain pump is a good part of your birdbath, attracting birds to bring your garden vitality. TOMONOLO solar fountain is made up of highly efficiency solar panel and new brushless pump. Start-up fast, efficient and strong stability. In addition, No hassle with electrical outlet or external battery, just let it floats on the water and run itself under sun, convenient to use. Perfect for bird bath, fish tank, small pond, garden decoration, water circulation for oxygen, etc. The solar fountain pump has 4 nozzle spray settings to create different water views, each with its own unique design. The maximum spray height up to 29.5 inches. Upgraded Solar Fountain Bird Bath Pump: no battery or electricity needed, just floating the fountain on the water and it runs automatically in 3 secs when the sun hit the solar panel. Powerful Solar Fountain: Made from upgrade high quality solar panel, this pump has higher efficiency compare to most other pumps, shoots water up to 29.5ft in the air under strong sunshine(The water maybe splashed out if your birdbath is very small, you can use the pump without nozzle to lower the height of water). Durable and High-effiency: This new version pump was made from upgrade high quality solar panel, which made of high-temerature resistant material. In the manufacture process at 130 degrees Celsius, the panel and the bottom adhesive layer was laminted to together, no distortion, no fading. Let the fountain is more stable during long time use. Four different spray heads: Come with four different spray heads. You can easily change the spray heads to get different water pattern. This is a floating water fountain pump, but if you don't want it floating everywhere, you can also use the suction cup to secure the pump. 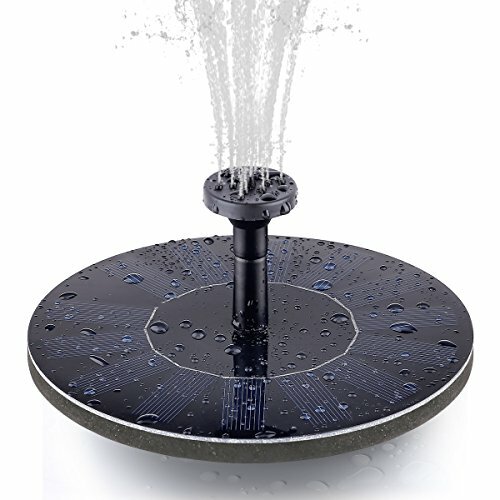 TOMONOLO fountain can aerates the water and keep water circulating. very suitable for bird bath, attracting birds to bring your garden vitality. you can also use it for fish tank, small pond, pool, garden decoration, water circulation for oxygen and etc. 12 months warranty：100% warranty and friendly customer service. If you have any questions about this product by TOMONOLO, contact us by completing and submitting the form below. If you are looking for a specif part number, please include it with your message.